Explore how your employees feel about your brand by asking whether they’d recommend it to others. With our eNPS survey software, you get to see whether your employees advocate your products and services, or tell people to stay away. Used as part of a wider employee experience program, it can help you understand your employees better. Get the most from eNPS with a ready-to-go survey built directly into the Experience Management Platform™. And if you want to tweak the wording a bit, it’s easy - just go into the survey builder and edit away. No design or IT support required. Take the first step to improving your employee NPS by just asking the question. By collecting eNPS feedback from across your organization, and analyzing it alongside other key metrics, you can create a more holistic view of employee experience. To get the most out of eNPS, ask your promoters why they like you, and your detractors why they don’t. 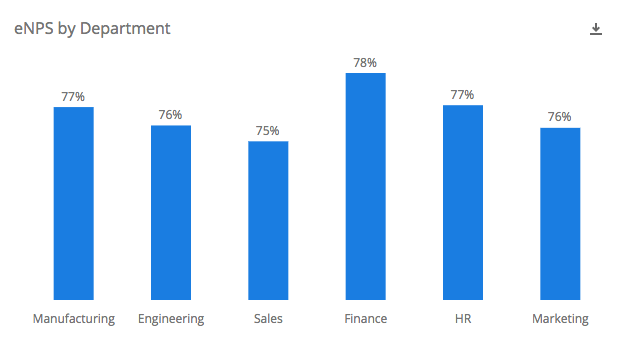 This kind of survey feedback gives you richer insight into what is driving employee engagement, especially when analyzed alongside other metrics. It’s easy to build a survey that asks different questions of different employees, depending on their eNPS rating. No IT know-how required – just go into the survey editor and, for example, ask your passives what would make them move up to a 9 or 10 score? With Qualtrics, your eNPS survey tool is baked into the Experience Management Platform™ and can form part of a wider human resources program. 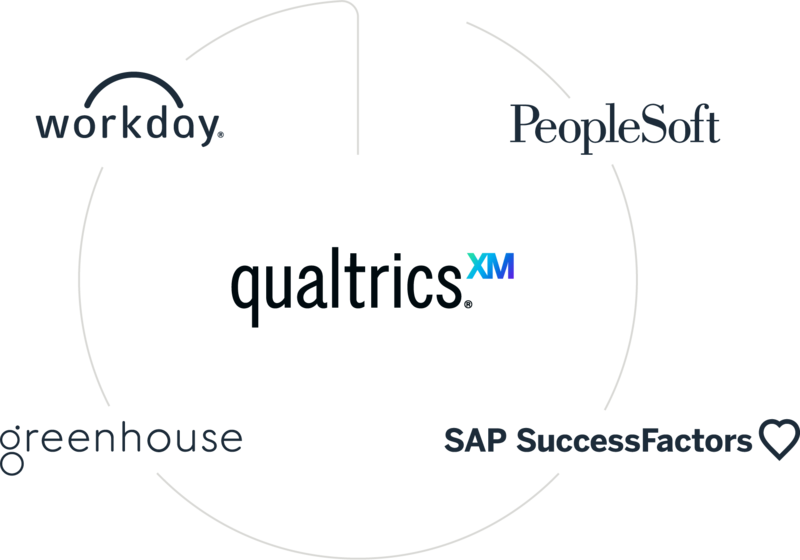 Qualtrics integrates with the most popular Human Capital Management (HCM) systems on the market. 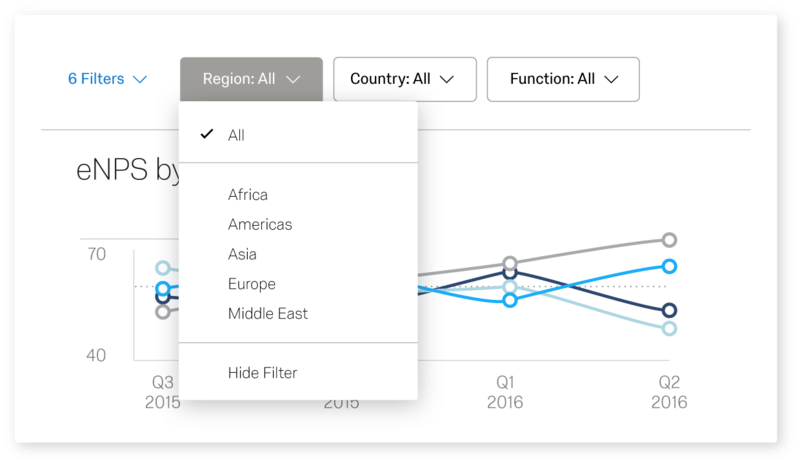 Review your employee Net Promoter Score in simple dashboards and reports, and choose how you make aggregated data and insights accessible to managers and teams. eNPS – aka employee Net Promoter Score, or Employee NPS – is a way of measuring how your employees feel about your company. It’s based on Net Promoter Score, a measurement of customer loyalty that was pioneered by Bain & Company and Fred Reichheld to measure customer experience. 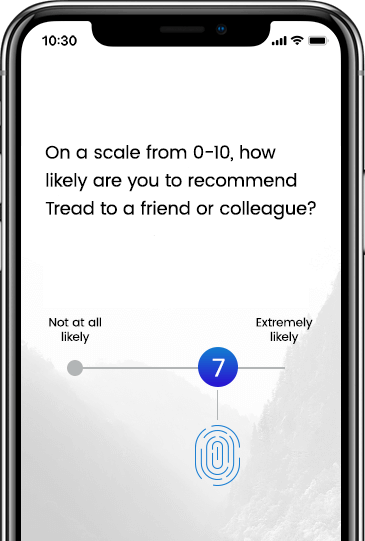 You run an eNPS survey by asking someone one simple question: ‘On a scale of 0-10, how likely are you to recommend this company’s products and services to others?’ Some companies like to be more specific and ask would you recommend it to ‘a friend or family member’. If they answer 9-10, they’re a promoter; if they answer 0-6 they’re a detractor. You calculate employee net promoter scores by deducting % of detractors from your % of promoters. You ignore those who score 7-8, otherwise known as your ‘passives’. This 11-point scale aligns to the classic customer NPS, and also offers more variance by looking at Promoters-Passives- Detractors. If you only use 5 points, it changes the distribution and categorization of respondents and can inflate results artificially at both ends.